There wasn’t a ton of great new trailers to talk about this week but there were still a few notable ones like the reboot/continuation Jumanji: Welcome to the Jungle, Borg vs. McEnroe, Death Note, Cult of Chucky, and more. Check out everything I rounded up below, along with my reactions. While the Shia Lebouf saga continues to unfold like a glorious trainwreck, he’s managed to squeeze in a couple movies in between his shenanigans. No matter what you can say about him, you can’t really deny his ability to act. 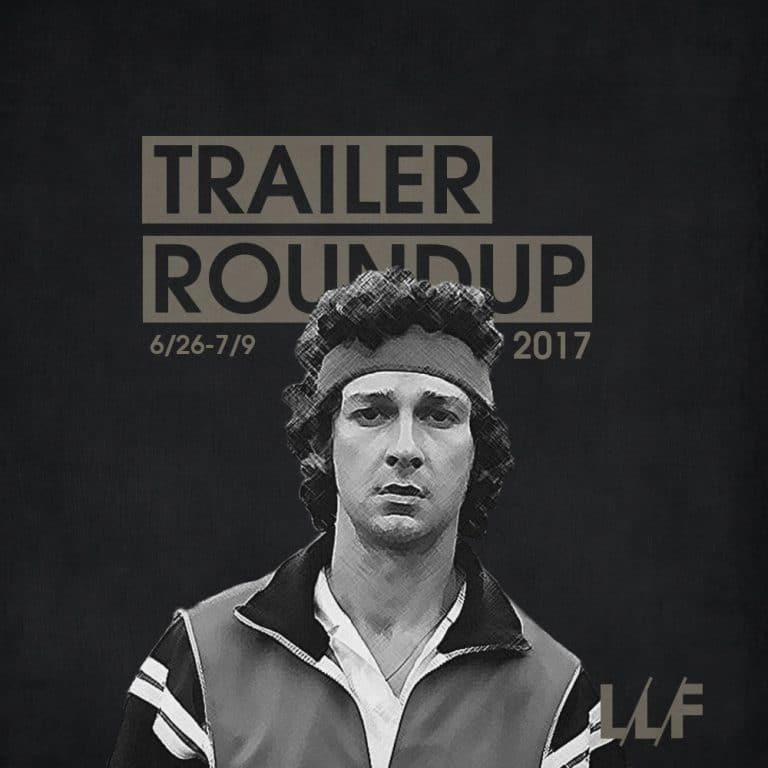 He’s damn good and after everything we’ve learned about him, playing McEnroe should fit him like a glove. Looks like this might just be an awards worthy performance, so I’ll definitely be checking this one out. Jackie Chan was basically my childhood. I loved all of his earlier works and his stunt work is all-time great stuff. His recent stuff hasn’t been great and he’s obviously slowing down a bit due to age, but this is the first movie of his that has actually piqued my interest. Fully embracing the old age and turning in what looks like a Liam Neeson, Taken-esque role should be a good watch. I was not feeling the first trailer for Netflix’s live-action adaptation of Death Note at all, but this trailer has sold me a bit more. Instead of copying it beat for beat, they seem to be trying to create their own unique version which could work out. I still don’t have high expectations, but it’s got me intrigued. Not gonna lie, at this point these kind of films are a bit…cliche, and the quality seems a bit TV-esque. So the fact they got such a great cast is probably the most interesting thing about the trailer. Could be good, but most likely forgettable. Despite Amazing Spiderman not panning out, Andrew Garfield’s been a busy man. He’s back with another ‘based on a true story’ tale that sees him playing a man that doesn’t seem too different from one of his last starring roles. I’m sure he’ll do a fine job, it just doesn’t look like my kind of movie. Oh Chucky, what have they done to you!? At one point he was one of horror’s great faces but I think it’s time they let this one be. A direct to DVD, cheap cash-in is probably the worst death he’s faced throughout his whole saga. Sad end to an icon. I know I was at the tail end of polaroid’s life, but it still feels weird to see these things considered antiques/novelties already. That’s probably the freakiest part of this whole gimmick based horror that will play out exactly as you expect it to. That’s gonna be a no from me dog. I guess seeing as the traveling circus is now essentially dead, it’s only right Hollywood would be cashing in on it’s still rotting carcass. I can’t tell if this is a musical, but I feel like it’s a musical, and seeing Jackman and Efron’s love for musicals I wouldn’t be surprised if it turned out to be one. That is one genre of film I don’t think I’ll ever be able to get into. Pass. I love The Rock as much as the next person but good god I don’t think I’ll ever be able to forgive him for doing this to one of my all-time favorite childhood films. Replacing the board game for a video game, and classic Robin Williams humor for cheap gags and action, looks like the poster child for everything wrong with modern reboots. Sigh. F**k you Hollywood, very much.